Wage dispersion: Unionization and minimum wages are usually thought to reduce inequality by helping equalize the distribution of wages, and economic research confirms this. Unemployment: Some economists argue that while stronger unions and a higher minimum wage reduce wage inequality, they may also increase unemployment by maintaining wages above “market-clearing” levels, leading to higher gross income inequality. But the empirical support for this hypothesis is not very strong, at least within the range of institutional arrangements observed in advanced economies (see Betcherman, 2012; Baker and others, 2004; Freeman, 2000; Howell and others, 2007; OECD, 2006). For instance, in an Organisation for Economic Co-operation and Development review of 17 studies, only 3 found a robust association between union density (or bargaining coverage) and higher overall unemployment. Redistribution: Strong unions can induce policymakers to engage in more redistribution by mobilizing workers to vote for parties that promise to redistribute income or by leading all political parties to do so. Historically, unions have played an important role in the introduction of fundamental social and labor rights. Conversely, the weakening of unions can lead to less redistribution and higher net income inequality (that is, inequality of income after taxes and transfers). I have spent a lot of time thinking about what has caused the major upswing in inequality since the 1980s. Back in 2011 and 2012 my analysis tended to emphasize financialization and specifically the massive growth in credit creation that took place since the 1980s. I think this was a rather naive view to take. I don’t think I was wrong to look at financialization. Obviously, unchecked credit creation is a plausible pathway for the rich to make themselves and their friends richer. I just think it was naive to not see financialization — like deunionization, like globalization, and like trends in housing wealth — as part of a broader pie. My hypothesis is that what changed is that politicians decided that greed was good and that “industrial policy” was a dirty phrase. The political structures that emerged in the wake of the Great Depression and World War 2 which together greatly limited inequality — welfare states, nationalized industries, unionized workforces, constrictive financial regulations like Glass Steagall — were severely rolled back. This created an opening for the rich to get much richer very fast, which they did. 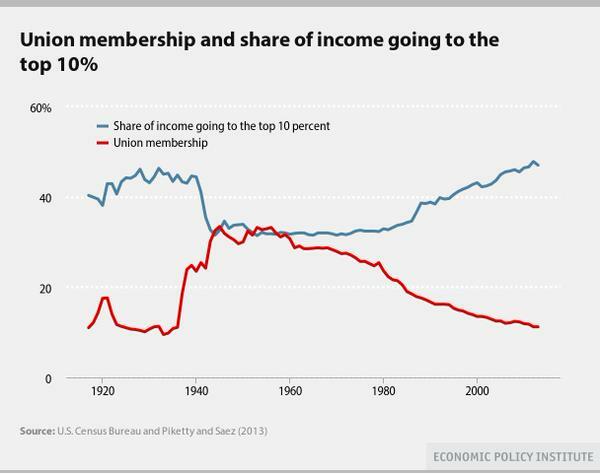 If I’m right, it would take a major political shift in the other direction to start reducing inequality. This entry was posted in Economic History, Economics and tagged 2011, 2015, 2020, aggregate demand, banksters, financialization, industrial policy, inequality, reagan, thatcher. Bookmark the permalink. The deplorable labor conditions that existed in the 1920’s-30’s simply do not exist today. When there was often only one employer in town, unions were necessary to protect the labor force that had little choice of employment. Today, with the increase in mobility and the many competing corporations that vie for workers, labor has choices. These choices have removed the monopoly that the old mills and factories had over labor. As a result, a drastic increase in labor unions today would not have the extreme effects that unionization had 80 or 90 years ago. The monopoly that the old factories had exists in municipal employment. There is only one police department in a city, one fire department, one utility company, etc. In the US, labor unions have a stronger hold on government employees than in the private sector, and we have seen an increase in wages/benefits for public employees – to the detriment of their employers, the tax payer. But unions would not have such impact in the private sector today, which at least partially explains why union clout has diminished. Dunno why you’re trying to dictate to the market what functions workers do and don’t need. Isn’t that what labor unions do? But unions are a relatively small factor in a multifaceted economy. If we are trying to determine why the rich get richer, we should focus our attention on the relative values of labor and capital. There probably was a time when labor was as important as capital. Or at least close. 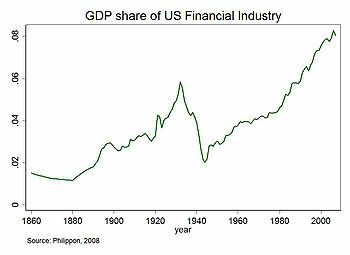 That balance started to slip with the industrial revolution and has continued to slide in favor of capital with the increase of automation. So much can be produced with so little labor that capital has become more important. Naturally, he who controls the capital will acquire the larger share of the profits. And he who MANIPULATES capital just might make even more. Thus, the banksters get rich while the worker struggles to find profitable employment. Yet this, too, is but one factor. We are fast approaching a point (if we haven’t already reached it) where the LABOR of all of the population is not needed to meet the NEEDS of all of the population. Higher unemployment is inevitable. Demanding higher wages only encourages additional automation – and less employment. (MacDonalds announced it is replacing cashiers with touchpad kiosks in Europe). When the value of labor is diminished, capital is king. No central planner or labor union can rectify this situation. Labour unions don’t dictate to the market. They are a part of the market that fight for the rights of those they represent. I don’t really buy the distinction between labour and capital very much though. They’re two slices of the same pie. Yeah automation is changing things. But that doesn’t apple equally to everyone field and sector. And arguably makes unionization even more important — not just to fight for workers’ rights, but to fight for universal basic income. Your apparent love affair with unions may make further discussion difficult, but I’m willing to try if you are. True, labor’s importance varies with the industry. No amount of automation will replace lettuce-pickers. The agricultural industry certainly seems to cry for someone to stand for labor’s rights. This is not so apparent in white-collar fields. Where unions have fought for and gained wage increases has been in fields where labor is valued. If the employers cannot stay in business without labor, they will bend to the demands of an organized labor force. But only to a point. Once the cost of labor exceeds the value added by those workers, no union can push further. I mentioned MacDonalds earlier. I’m at a loss as to your meaning for the expression “universal basic income”. It sounds vaguely like “living wage”, a term in fashion here in the colonies. Sounds great, but defies definition. I doubt you’ll find a doctor, lawyer, plumber or auto mechanic working for minimum wage. Skills and knowledge command higher wages. All labor is not equal, so neither will wages be equal. When what a laborer thinks he/she needs doesn’t correspond with the value of what they offer, they will be disappointed with their paycheck. The solution is not to organize and demand, but to gain skills and knowledge. I have no love affair with unions. I just think they’re a basic part of the apparatus of any capitalist system. Labour is always going to be a major aspect of capital, even with a high degree of automation. Unionization is a basic function of the negotiating process. Workers want as high wages as possible. Employers want as low as possible. Unionization is a means for workers to achieve their aim, just as employers have means to achieve their aims. Universal basic income means free government money for every citizen (or under some variants all citizens who earn less than X), so work becomes a voluntary choice. Obviously this would be paid for by taxing the corporations who own all the robots/automata. It was supported by many conservative economists such as Milton Friedman (who conceived of it as a negative income tax) and Friedrich Hayek. My apologies for conflating that term with the inane “living wage”. The problems, as I see it, with the concept of government paying everyone who doesn’t earn “enough” (besides the question of who decides what is “enough”) is who will pay for it. If personal income tax rates must be raised to finance it, we will have fewer and fewer workers supporting more and more people who volunteer to get paid for staying home. Worse if, as you indicated, the funds come from higher corporate taxes. Who do you think pays corporate taxes? Consumers! All expenses, including taxes, are built into the price of goods and services. This means not only taxing the workers but also taxing the beneficiaries of this welfare program. Kinda defeats the purpose, doesn’t it? As the tax rate rises, the cost of goods will rise, causing the definition of “enough” to rise…which will necessitate an increase in tax rates…which will raise prices…which will……….. But not to worry. Any politician who suggests such a plan will most likely get elected, since most voters don’t understand economics – or mathematics. I find Paul Anthony comment’s rather amusing. He seems to be completely focused on the US when he mentions labor conditions are nowhere as harsh as they were in the 1920’s. I agree labor conditions may not be as inhumane as they once were in the US (largely due to Unions); they certainly are abysmal overseas. As I see it, the main difference today is the Fortunate 5000 has just moved production to areas of the world way the can continue their oppressive practices. Not much has changed just the location. In regards to who controls capital, why can’t the banks simply be owned by the community itself? The interest generated from their loan activity would than be paid back to the citizens of the region where the bank functions. Of course I’m focused on the US. It’s where I live. Working conditions in some parts of the world seem dismal BY WESTERN STANDARDS but often better than what local businesses offer. It’s all relative. Your idea about community banks is not original. I have all my accounts with a credit union. Credit unions are structured as co-ops. Everyone who opens an account is an owner. Each year, if the credit union makes a profit it pays it back to the members. I don’t understand why so many people allow banks to rip them off when there is this alternative available to everyone. But, as I said before, most people don’t understand economics or mathematics. My point his without unions and other social active groups I’m not so sure the US manufacturing standards would be all the great. What you appreciate in the US is hard fought labor improvement conditions. I think to improve leaving standards world-wide we need unions to become more international in scope. It’s what major corporations have done on their in. At this rate, with the non-sense about being competitive on a global scale, I’m not so sure our labor conditions will be all that great anymore. We are all in a race to bottom. On the banking front, I’m talking more in line with what Iceland is up to: Taking the power away from private banks to create money out of nothing through fractional reserve practices. My idea of a regional based community bank that would issues the loans in which the interest would be payed to the community group. I would say I’m In line with Bill Still and Ellen Brown’s movement. From my foray into politics, and infiltrating the Leftist Anarchist movement that has a big influence on Leftisit media and politics in Australia ( And elsewhere), I have discovered that the utopian dream the Anarcho Communists want filters down to socialist and “progressive” views of their less zealous followers and sympathisers. As a result policy has been geared towards mass migration (It’s “racist” to challenge this) and deindustrialisation, which the business class has actively encouraged as it increases profits. The middle class suffers, the lower classes never lose as they get welfare and prefer that lifestyle, and the third world improves. This fits in with the UN agenda to send 25% of industrial production to the third world by about now. So economics is really a social science and the political ideology of some pretty sick and zealous people has seen the decimation of the middle class in the 1st world. But the tide is changing. Nationalist politics is gaining traction. The third world will have to develop on its own and look after their own people. People really are tribal and self interested.